Most program participants encounter, especially when they return in another season or year, the constant pulsing of change woven into land-based life. There's nothing stagnant about it, except perhaps the humans in our thinking or understandings sometimes. This year has been a great time of change for GeerCrest - and looking ahead, will continue to be. As many of you are aware, our principle focus for the last decade or so has been in providing farm-life programs for all ages while maintaining the farm and preserving food for programs. This year we recognize that our beloved 1851 farmhouse will require a new roof as soon as possible as well as extensive renovation within the next couple years. The same goes for the “stonehouse” — the stone fruit cellar. These will be significant endeavors. In making the first steps, there will be a couple significant affects on programs this coming year: overnight summer campers will be bunking in one of the forest cabins; lovely, yes, however, it will mean that our camps will be single gendered in 2019. Camp dates are now on our website and we are accepting deposits. We hope to have another cabin finished in 2020 to allow for coed camps, until the farmhouse is fully ready to host again. We are also working toward building a licensed kitchen in the existing dairy kitchen/office, to take pressure off of the farmhouse kitchen during the period of renovation (as well as increasing our capacity to serve amazing meals). As I mentioned, these are big endeavors and we will be asking for your support in fundraising, event planning, and recruiting new board members to make it all happen! Another impact is that, with our focus needing to be on getting ready for building and renovation projects, while fundraising and grant writing, we have chosen to give the beloved goats a year off and not breed them this fall, as midwifing is not something we take lightly. So, sadly, there will not be baby goats this spring for the first time in years. The core flock of at least 8 goats will still be here, hard at work in the blackberries and pasture. The beloved horses, Alf and Special, and goat buck Bruno have also found a new home, not too far away, reuniting with Special’s daughter, Nadia. The horses are finally being exercised and trained which has been beyond our capacity here at GeerCrest. Next year we may begin the search for a couple small cows (Dexters, we hope) to take the horses place as large footed grazers. For now, the rest of our programs should continue as normal. We are excited to welcome you back for Farm Fresh dinners in 2019, which will have more of a community and educational focus this year, and lower price. We are still hammering out the last details with presenters/facilitators/musicians, but most dates are set on our events page. We will also keep you posted in future newsletters and via Facebook. Hope you have a restful and reflective winter, a nourishing new year. Look forward to seeing you again soon on the farm! Please, as always, reach out if you have questions, feedback, or if you’d like to explore becoming more involved. As the weather shifts (slowly and gracefully for us this year) and the light dwindles, our work days change markedly from the images in the last blog post. Still plenty to do, but the pace, timing, and balance of things finally brings time to digest the year behind us, as we delve into planning for the coming year. I was thrilled to receive the newest issue of our local Silverton Country Historical Society newsletter and find an article by our friend, Gus Fredrick, sharing about his and GeerCrest owner Jim Toler’s “ex-perry-mentation” with Perry recipes utilizing the abundance of cidering pears here on the farm (perry pears are often too astringent or grainy for fresh eating or canning). I’ve had a number of chances to try their results and have been exceedingly impressed! To further celebrate the recent dedication of the heritage orchard here on the farm, we are featuring Gus’ article, with his kind permission, in this week’s blog post! Before we delve in, one more mention of our planning process for 2019. Our Summer Camp schedule is now active on our website! As far as events go, we are still deep in planning and hope to have updated calendar before the new year. We hope to see more folks coming out to GeerCrest this year to share nourishing food, community, experience the farm, and have opportunities for dialog and education. We plan to have much less expensive Farm Fresh Dinners, and create a venue for lectures and dialog on Native and pioneer history and culture, food, and beyond, in addition to featuring local musicians. If you have ideas or suggestions, or would like to be involved please be in touch! OK! Take it away, Mr Fredrick! Grampa Ralph’s Perry, by Gus Fredrick. Featured in the Winter issue of the SCHS Newsletter. In 1847, a nurseryman from Illinois named Ralph Geer, joined his family and traveled West along Oregon Trail. He brought with him bushels of apple and pear seeds. With the assistance of fellow nurseryman Henderson Luelling from Indiana, the two men founded the first non-native nursery and fruit industry in Oregon, and made a killing selling fresh fruit to the Californian gold miners. Today, the Geer farm south of Silverton still has trees growing from the original plantings, and on October 19, 2018, the Oregon Heritage Tree Program dedicated the surviving GeerCrest Orchard as new Oregon Heritage Trees. The Oregon Heritage Tree program is part of Oregon Travel Experience. In the orchard are 24 pear trees, four plum trees, one apple tree, one hawthorn tree, one butternut tree and one hickory tree that are believed to date to the original plantings from 1848. Of most interest to myself as a home brewer, was the pear trees. Specifically what can be made from them: Perry, a fermented beverage made exclusively from pears, in much the same manner as hard apple cider is created. 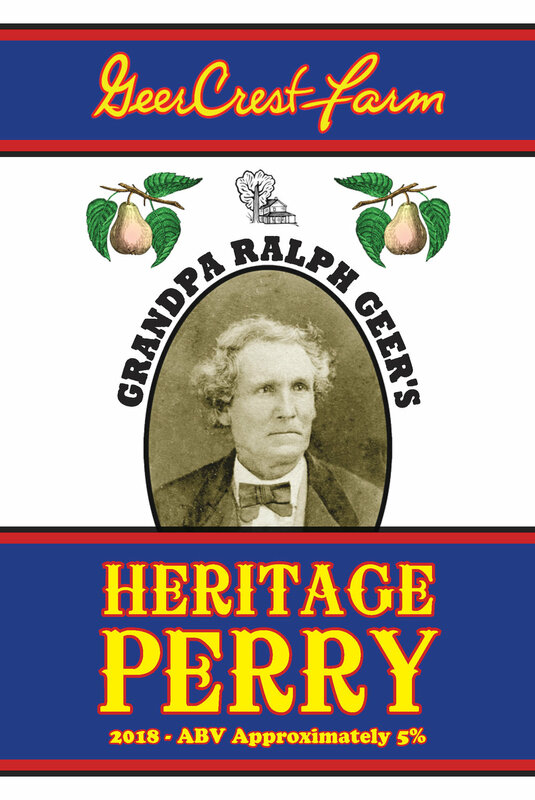 Several years back, Jim Toler from GeerCrest Farm found a notice in an old Salem newspaper reporting that Ralph Geer had won a Perry Competition at the Oregon State Fair in the 1850s. So last year, Jim and I whipped up several batched of Perry, for later enjoyment at the monthly Farm Fresh Dinners at GeerCrest. Since we lacked any recipes from Ralph, I consulted several antiquarian sources from the early 19th Century. England and France during this period produced a wide variety of Perrys, which we attempted to duplicate using modern brewing techniques. We used Jim’s hand-cranked cider masher and press to squeeze out almost two dozen gallons of fresh pear juice. I did three different batches, each with a different yeast strain: Belgian farm style for one, Red Wine yeast for another and the third we let “go wild” and fermented it out with native yeasts. The Belgian one was the winner, as it finished out somewhat dry with notes of fresh pear, and an alcohol level comparable to wine. Indeed, this batch was basically a “pear wine.” To clear the finished brew, I first pasteurized the batch, then added a tiny amount of skimmed milk, as per one suggestion in “Cider & Perry – Reduced to Rules” from 1827. Other “fining agents” include isinglass, (fish bladders) and sea weed, (aka “Irish Moss”). Needless to say, the Perry was a rousing success! At least that one batch. The others, not so much. But I took good notes! And we are in the process of brewing a new batch for the 2019 Farm Fresh Dinner season. The main batch of seven gallons will be from the “Pound Pears” which Grampa Ralph used to win his ribbon. It is also one of the pear trees included in the newly designated Heritage Orchard. As the raspberry & strawberry bounty wanes here on the farm, I am reminded of the life lessons they offer us. When we're harvesting the berries, we must pay close attention. If we pick them too soon, they will be tart. We must gently grab each berry. With the slightest pressure, the ripe berries will pop right off. If we force it, we will get a berry, but it will not be the sweet reward that we want. It will just be a sour substitute that looks similar. The berries also hide in many places, under leaves & deep within the patches. We cannot see them all if we are just standing at the same point. Bending down & changing our perspective will offer previously unseen bounty, ready for the pickings! Each berry requires just the right viewpoint & applied pressure to be harvested. Here at the farm, we can harvest 10-12 pounds in one gathering! That's a lot of effort exercised on each individual to amass such a volume of delicious treats. The berries teach us to take our time, pay close attention & be patient. These practices, utilized with a varied perspective will result in the most rewarding outcome! GeerCrest Farm & Historical Society received a $6,000 grant from Willamette University Atkinson Graduate School of Management (AGSM) to further develop its farm-life educational programming. Adam and Cayla (in the middle) along with Students from the MBA program. GeerCrest Farm will use the funds to expand programs that provide leadership opportunities for local middle and high school students, in mutual support of all currently offered programs. The organization will create a new classroom for traditional craft and skill instruction on wool working, basket weaving, making of herbal medicines, and more. “By learning about animal and land care and the use of renewable local resources produced from the land, students also learn vital self-reliance skills that connect them to our collective human history as well as that of local pioneers,” said GeerCrest Farm Director Cayla Catino. AGSM graduate students administered the first-year grant program as part of their own experiential learning project. The grant program aims to impact local communities in Marion, Polk, Benton, Linn and Yamhill counties in the areas of education, arts and culture, and green technology. At the same time, graduate students learn how to administer foundation funds. Other recipients of this year’s AGSM grants include: Bridgeway Recovery Services, Inc., Children’s Educational Theater, Historic Elsinore Theater, Family Building Blocks, Friends of Straub Environmental Center, Marion-Polk Food Share, Salem/Keizer Coalition for Equality, Salem Leadership Foundation, The Boys & Girls Club of Salem and Willamette Heritage Center. “It was such an honor to be in the room with so many great organizations doing amazing work in the Willamette Valley,” said Adam McKinley, Farm Steward and Education Coordinator at GeerCrest Farm. Maybe you love being around other people. Maybe gathering with perfect strangers is your ideal way to spend an evening. Or maybe, and maybe more likely, you're like me. I am an introvert. I love to be alone. As an American, I am a product of our individualistic society, and I love the freedom of choice that our society champions. The prospect of Groupthink, a conformity of thought and the abandonment of truly independent inquiry and assessment, which can emerge out of self sorted bands of society, terrifies me. I cherish independence of thought, adhering only to what is true, remaining ever skeptical, and willingly discarding ideas that cannot hold up against questioning. On a much less noble note, when I contemplate joining a group event, my hesitation comes in no small part from the memories of all the stupid things that have escaped my mouth when I was surrounded by people I didn't know well and was awkwardly attempting to be a conversationalist. I spend a lot of time alone. Yet, I recognize on a level equally intuitive and analytical, the immense value of joining with others to share space, time, and our brief experience of living. Life has taught me that the things that are most terrifying are often the most necessary. Too much of anything can be harmful. Too much comfort of independence can quickly become isolation, disconnection, and a very inaccurate assessment of yourself, the world, and your place within it. If I was ever feeling terribly exceptional (either at the talented or the deficient end of the spectrum), joining with others in community has always reminded me that my differences are swallowed up in similarities. How much of a self-professed seeker of truth can I really be, if I don't seek out the truth about myself that can only be found in the context of me within a group? Would any scientist claim to understand a wolf by observing it only in isolation? The wolf's behavior within its pack is an inseparable component of the individual. I cannot let fear of the next stupid thing I'm going to hear leaving my lips keep me from learning what that says about me. Besides the inconsistency between isolation and self-knowing, joining with others brings a whole host of benefits and experiences I'm not likely to have while alone: laughing out loud, the warm feeling of being kind, the kinship of connecting over shared fears and loves, just to name a few. But still, I am an American living in America, and opportunities for communal experiences do not abound. We may enjoy going to a restaurant to feel the vibrancy that comes from being surrounded by others, but we are very unlikely to leave the restaurant with more friends than we had going in. Alain de Botton, in his book, Religion for Atheists, points out that, while restaurants may be seen as "refuges from anonymity and coldness, [they] have no systematic mechanisms by which to introduce patrons to one another, to dispel their mutual suspicions, to break up the clans into which people chronically segregate themselves, or to get them to open up their hearts and share their own vulnerabilities with others." De Botton points out ways in which the proximity to strangers required by sharing a meal around a single dinner table, even an act as seemingly inconsequential as asking a stranger to pass the salt, disrupts our ability to cling to an abstraction of "the other." Am I overthinking a simple farm to table dinner? Well, not in the moment, at any rate. Because while I am there, seated at the table, learning new names, hearing new voices of laughter, witnessing the unique sparkles in strangers' eyes, enjoying my silent, inner amusement at all of our idiosyncrasies, and being nourished by a meal made with love, I'm simply having a really nice time. Welcoming new goats to the Farm Family! It's really feeling a bit more like Spring lately, huh?! Well, as you might imagine, we are feeling Spring strongly here -- from the bursting greenhouse of vegetable and herb seedlings, to the faint green of leaves appearing in the trees, to the... oh my! hehe ... the long awaited baby goats in the barn! Over the last few weeks we have welcomed 9 baby goats into the family; two of which came last night, both healthy boys, making the tally 5 bucklings (boys) and 4 doelings (girls) so far, with 3 or 4 more expected by the end of March. Gloria discovering motherhood -- babies taking their first big drink. I am so grateful to have the gift of being present to midwife our goats, as every birth is a truly timeless and humbling experience to witness, always a lesson in the powerful wisdom of mothers. The birth last night was of a first-time mother, Gloria. Watching and supporting her through labor, then in the first day of motherhood, it has obviously been a huge rite of passage for her -- a transition that demands focused learning and transformation -- what feels to me a mix of an activation of the creature's innate knowing, integration of modeled behaviors from their mothers aunties and grandmothers, and just plain figuring it out. For the first week after birth we keep the mothers and newborns in their stalls to allow for deeper bonding. Separation from the flock for a week tends to ease the whole process, as the mothers for a while are very concerned whenever they can't see their newborns. So by a week old, when the new goat's legs have developed enough, they are integrated back with the rest of the flock. Currently, the small red barn is our nursery, where the three mothers sleep with the 7 two-week old kids and everyone curiously peeks in on the new mother's stall. A few times in the night, the mothers wake their babes to drink, and of course the kids go into late-night play -- chasing each other or trying to jump on their moms or aunties, before getting woozy and snoozing away again. To ween the little ones from their mothers milk, in stark comparison to a "conventional" dairy, we strive to make the process as gentle as possible. It starts three weeks after birth, when the kids are naturally getting curious about solid food, by taping the mother's teat for a portion of the night. This portion slowly becomes longer until after three months, the kids are fully eating solid food. Today I was reminded of a story told to me by one of our beloved board members on his return from backpacking in Tibet. It was an image of a steppe nomad family that he stayed with. The family's cozy black tent of woven Yak-hair protected both the family and their animals from biting winds -- you can imagine a small pit fire in the middle of the tent and toddler Yaks fidgeting next to their cud-chewing but otherwise still mothers. It was in this setting that their host went into labor with few human companions present, and after having a normal birth, she returning not long after to the role of host. For me, this image summons a sense of grace, perseverance, and loving tenacity of motherhood, something I witness in the barn, too, in a goat kind of way. Here's to Spring! Wishing you all the tenacity and perseverance of Spring in all your good work in the world. Let's celebrate the strength and beauty of our diversity. The other day I met one of the most interesting individuals I have ever met. Nick is around ninety years old and lives with his wife down south of Eugene. He has a good piece of land full of various livestock ranging from mules to emus to goats and alpacas, but Nick also has a collection of around 6,000 different fruit trees. On 10 acres he has built one of the largest private collections of apple trees with 4,000 different varieties planted on the property. The reason for visiting this farm was to collect scions, a young shoot or twig, from rare older varieties that correlated to the ones the Geer family originally had on the property in hopes to develop a heritage orchard on the farm. My expectation was that we would be searching for hours amongst the trees hoping to stumble upon the right ones that we needed. I was blown away when Nick provided a detailed book with the exact location of each tree by row and number in the row. Then when Nick insisted that he join us in the hunt for our scions I wasn’t sure what to expect but I am certainly glad he did. Our search only took about two hours and we found almost every tree. Even at ninety years old he knew exactly where his trees were and was out running around looking for them with us. I really enjoyed the opportunities to talk with him about his trees and about the different varieties of fruit he had on his farm. He offered information about grapes and figs, told us a little bit about his life before his calling to build his orchard. I feel as though I could have spent the whole day talking and asking him questions about fruit production and farming. I am most grateful though to have been able to witness such a passion and devotion to farming and an orchard. Jim Toler, Farm Owner and Geer Descendent and Cayla Catino, Director at the booth! Cayla with Governer T.T. Geer and his beloved bicycle. On Saturday, February 11, GeerCrest Farm & Historical Society had the privilege of tabling in the State Capitol Building at the Celebration of Oregon’s 158th birthday. We were in good company with representatives from the Gilbert House Children’s Museum, Champoeg State Park, and the Willamette Heritage Center also there. While showcasing our history, we also used the event to advertise our educational camps and monthly farm dinners. A great deal of interest was shown in these activities as we ran out of fliers and pamphlets before the day was done. Our friends Mark and Donna Hinds were there in association with Champoeg and Mark was dressed to impersonate Governor TT Geer with his bicycle. Outside the building was a replica stage coach and covered wagon, with demonstrations of blacksmithing and log cabin construction. Entertainment in the rotunda included old time fiddlers and square dancers. Many of the exhibits included children’s activities which drew large crowds and inspired us for next year’s event.